How much time do you spend each year managing your long-term dockage contracts? Sending contracts, determining the status of outstanding contracts and handling their payments can easily become a disorganized process that eats up time. That's why 3 out of 4 marinas believe their process for sending long-term contracts could be improved. Dockwa’s Contracts tool eases all such burdens. 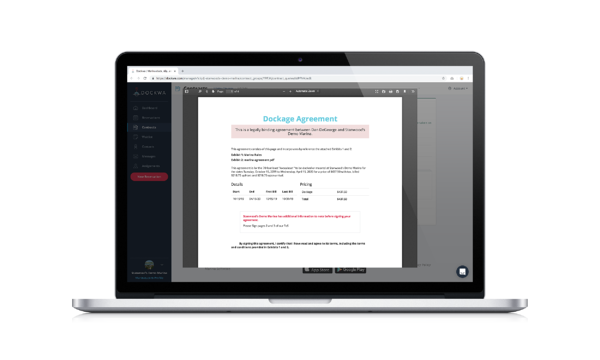 Contracts marries electronic signing with Dockwa's core reservation management and billing features - you'll save time, keep records secure, and remain flexible. Upload contract documents, set rates, and batch-email agreements to customers with a few clicks. 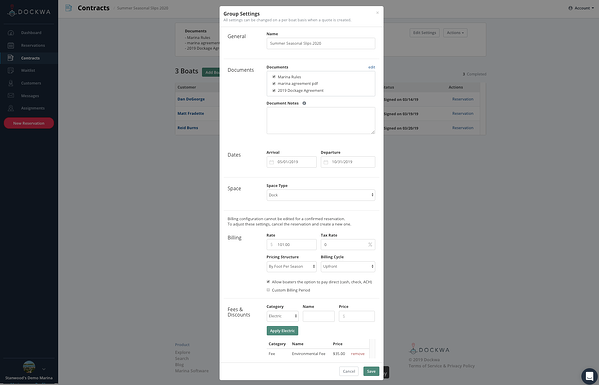 Creating and sending dockage agreements now takes just minutes. 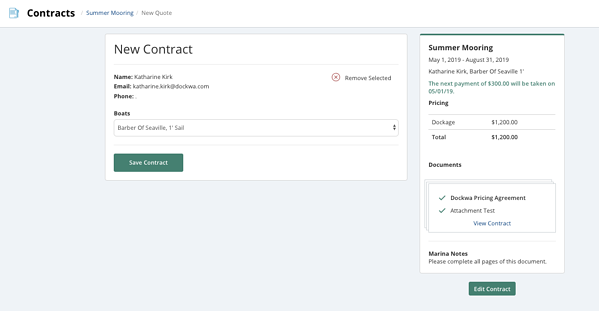 View, at a glance, the status of all contracts right in your Dockwa Dashboard. Know immediately whether or not a contract is signed and paid-for. Send and store all contracts digitally. E-signatures and credit card payments let boaters sign and pay for contracts on time with less effort. Set custom rates for long term customers. Whether a contract spans weeks, months, or years and whether it bills weekly, quarterly, or something totally specific to your marina, Dockwa Contracts will flex to your marina's needs. To start creating contracts with Dockwa, head to the “Contracts” section of your Dockwa Dashboard. Click “Manage Documents.” Here, you will upload the documents you need your long-term boaters to sign. These might range from marina rules, terms of service, waivers or simply instructions for accessing the laundry room. You will want to include anything you want your boaters to agree to or have along with the their contract. Once you’ve added all of your documents, head back to the “Contracts” homepage. Now, click “New Group” to begin creating your first Contract Group. This “group” will serve to categorize your long-term boaters and their contract details. For example, you may have boaters who pay for a year-round slip and others who pay for winter storage; in this case, you would create a Year-Round Slip Holders contracts group and a Winter Storage contracts group. Fill out the details of the Contract Group, including 1) the documents to which your boaters will need to agree, 2) the length of stay, 3) the price of stay, 4) how often the boater will be billed, and 5) whether boaters will have an option to pay via cash or check (vs. credit card only). Here is where you’ll add the individual details of your long-term contract holders. Once you’ve added your boater’s details, you’ll see a “Save Contract” button. Clicking this will prepare the contract to be sent to your boater. Or, if you're eager to get individual contracts to your boaters ASAP, click "Send" on any single contract marked "Ready to Send!" When you send, you will see the contract marked as “Sent," and boaters will receive an email with instructions to complete the contract. Then, when your boater signs their contract, you will see the contract marked as “Signed!" 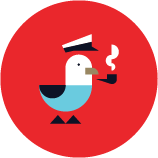 Have a boater “lose” their contract email? Click “resend” on their contract at anytime to get their contract back to the top of their inbox! "We’ve run the gamut of contract management processes, and we love the customization [of Dockwa Contracts]. Customers are accustomed to DocuSign documents, and adding an end-to-end system that handles both the contract signature as well as automatic payment processing was a huge benefit. There is also a definite time-saving component – once a customer signs the agreement, the automatic payment processing is scheduled and eliminates our team from having to track down customers for payments. We are very excited to launch our contract processing through Dockwa this season."